The pace of innovation has accelerated exponentially in recent times. As a result, a period of transformational change has started to sweep through the undercurrent of the UK’s rail industry. With an increased investment on improvements to the sector’s physical infrastructure, its digital infrastructure has been given increased prominence in the industry’s priorities. As the industry finds itself in the giddy throes of a digital revolution, it is a truly exciting time to be involved in rail. In the past decade alone, there has been a seismic shift in how the industry both considers and embraces technology to carry out vital tasks. The increase in the use of personal devices on site, accompanied by the volume and velocity at which data is now being generated, processed and stored, is entirely unprecedented. Data collection and storage has been commonplace in the industry for quite some time. However, the analysis and utilisation of the deluge of data available to the rail industry – by taking advantage of the fusion of smartphone accessibility and data analytics – lies at the heart of both true innovation and industry success in the future. The speed at which ideas can now be translated into reality has accelerated to such a degree, that the demand for technology is fuelling constant digitisation in rail. This, coupled with the accessibility of smart devices on site, enables high performing technology to be utilised more readily in the industry. There are, of course, complexities involved in moving the rail industry towards entirely digitally-led strategies, and there is still a lot of work to be done across the wider network to meet these goals. However, the leaps and bounds seen in rail since the Digital Railway announcement has not only supported the facilitation of some of the largest railway projects in Europe, but also shown the industry is seriously committed to finding new and better ways of working. Crossrail and HS2 are currently setting the standard for the future of rail’s digital infrastructure, while transforming its physical infrastructure. Project leaders are introducing new technologies, supported by innovative digital strategies to complete tasks throughout the duration of work. While neither project is considered a test run for the Digital Railway, the success of each project – as well as the lessons learned from both – will formulate the foundation of digital strategies on projects moving forward. As a result, investment of both time and resource into big data is vital. A key component, crucial to achieving the aims of the Digital Railway, is finding means of enabling the industry to work together as a collaborative community. Doing so, means that masses of data– currently independently owned by various stakeholders across the industry – can be integrated into a collective, accessible workflow. As a result, digitally-led processes and systems will enable companies to work and operate independently, but focus on collaboration and data sharing, to ensure the way rail utilises its data is transformed. Existing processes are naturally adopting to digitisation already, as companies gain increased insights and capabilities, that were not possible before the implementation of smart devices and digital strategies. The change is being championed by the workforce to now detect and identify patterns in ways of working. This allows workers to respond intelligently and in real-time, to potential issues or events, which in turn leads to a more predictive approach to both workforce safety and maintenance. The current paradigm in rail sees events being responded to reactively. However, in an industry as heavily-regulated as the rail, systematic digitisation and exploitation of data sets needs to begin actively replacing preventative maintenance approaches. This is now being seen in industry, with many of our own customers leading with digital strategies, underpinned by smart devices and app software. They are now able to successfully identify patterns and abnormalities that can affect the overall performance of entire teams and projects. However, these now need to be adopted industry wide, to facilitate proper collaborative communities and data sharing; enabling the entire industry to appropriately predict potential incidents, issues and events, before they impact operations. Systems and processes that can incorporate masses of historic trends and regularly collected data, alongside lessons being learned on current projects, enables the Digital Railway to go beyond the current preventative, cyclical model of existing approaches. The rail industry – if it is to achieve its long-term future goals – needs to reduce the capacity crunch and become a more reliable service. Reducing the number of acceptable risks, cutting maintenance costs and enabling accurate, targeted deployment of resources and assets within general infrastructure maintenance, will see that passenger demands are met sooner. The government’s ongoing commitment to the rail industry will see a steady stream of both public and private investment across the industry in the next few years. 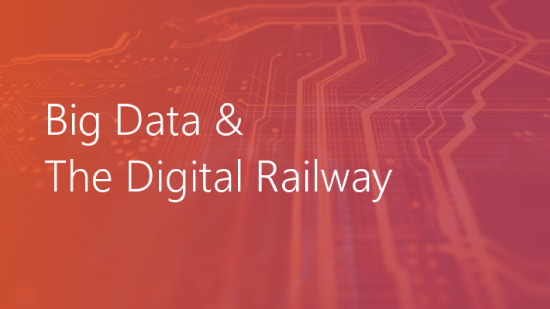 Therefore, an active commitment to predictive analytics – supported by a greater understanding of how to utilise data across the industry – means that rail’s approach to, and understanding of, its digital infrastructure is now a necessity. Labour intensive and costly paper-based processes are no longer effective, and the Digital Railway cannot succeed if the industry continues with unconnected, uncollaborative systems and processes. The Digital Railway is key to the UK’s ability to continue competing on a global economic scale. Projects, jobs and opportunities – as well as upgrades to the physical and digital infrastructures – will not only support the country’s growth, it will also support the further facilitation of data and enable the industry to finally take advantage of the opportunities that big data, predictive maintenance and technology can truly offer. This will improve passenger experiences tenfold, and transform how the workforce carry out vital tasks as the industry modernises and digitises the oldest rail infrastructure in the world.